March 23, 2015, WASHINGTON, D.C. – U.S. Senator Heidi Heitkamp today reintroduced her bipartisan bill to ease the financial challenges of adopting children in tribal communities in North Dakota and across the country. In all 50 states, parents who adopt children with special needs are able to claim the full adoption tax credit, helping to reduce the financial cost of adoption. However, if they open their homes to a child with special needs from Indian Country through tribal courts, that child cannot receive the same designation – preventing adoptive parents from claiming the full adoption tax credit. Heitkamp reintroduced the bipartisan Tribal Adoption Parity Act with Republican Senator James Inhofe from Oklahoma, to allow tribal governments to designate children as having special needs – just as states can – enabling adoptive parents to claim the full adoption tax credit. 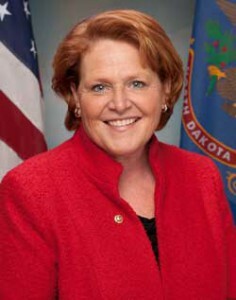 Read the full press release at Senator Heitkamp’s website. This entry was posted in Laws and Regulations, News and tagged adoption. Bookmark the permalink.